I love reading the tales and mythology from all over the world. A people’s culture is well represented in the stories shared over time. 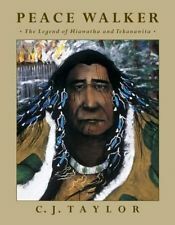 When I received the book Peace Walker: The Legend of Hiawatha and Tekanawita by author C.J. Walker, I was very curious to read it. I knew almost nothing about Hiawatha, other than the name and a ridiculous Disney cartoon. Before beginning the book, I decided to gather my wee ones, as they are the true test of such up book aimed at their age group. We all sat down and I read it to them after an evening meal. My little ones are extremely “busy.” Getting them to sit still is always a bit of a chore, but they seemed to enjoy this book with minimal distraction. The imagery within the story was vivid, painting pictures in the minds of my children and I. We learned of evil shamans and leaders, one so evil that snakes inhabited his hair! The pictures already contained in the book added to the story, rather than taking away from what we were imagining. And at the end of the book, we found out how the story played into the formation of the United States’ democracy. This story is definitely one to be treasured and shared. In fact, I would go so far as to say that it should be part of the curriculum in the elementary social sciences courses. What a fun way to learn!